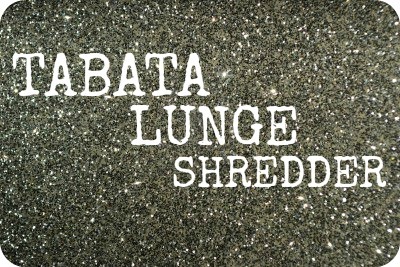 Tabata Lunge Shredder: Workout Infographic ! Home Workouts	Tabata Lunge Shredder: Workout Infographic ! It’s time for another crazy muscle-sculpting, fat-melting and super-intense workout session! For those of you who are following the Bikini Pow 4-week challenge, this will be your second workout of week 3. In order to reap the full benefits of this type of training, you will need to give it your 100% during these short bursts of high intensity exercises. This workout might only be 4 minutes long, but if done properly, it will get you amazing results while keeping your metabolism up all day long! Set your interval timer to 4 rounds of 20 seconds (exercise) : 10 seconds (rest) intervals. Once you complete your first round, repeat one more time, taking a short break in between the two rounds. In case you don’t have your own interval timer, I have set one up online for this workout: Tabata Lunge Shredder Online Interval Timer. Make sure you warm-up properly before doing this intensive workout (5-10 minutes), once you complete one full round of the following exercises (see order and breakdown below infographic), take a short break (less than a minute) and repeat one more time! Once your done, cool-down and stretch out those muscles, they will deserve it! You’ll be in fat burning mode for hours after finishing your workout, enjoy it! Frog lunge hops – starting in a front plank position, hands underneath the shoulders, body in a straight line, core tight, looking downwards. Hop forward, bringing both feet below the chest while keeping your toes in front of your knees. Hop back into a plank position and keep going in this manner until your timer beeps. Stationary lunge jumps – start in a basic lunge position, bringing your right knee to the front, core tight, front knee bent 90-degrees and toes in front of the knee. Remaining in the same position, jump up and land back down. Switch legs in the following set so that you perform two sets on each leg during the workout. Skater jumps – keeping your chest up & back straight, start by standing on your right foot, keeping your left knee and hips slightly bent to a 45 degree angle. Hop to your left, gently landing on the ball on your left foot. Immediately jump off your left side to the right again, keep hoping from one side to the other. Scissor lunge jumps – step your right foot into a lunge position, bringing your leg to a 90-degree angle, keeping your right toes in front of your knee. Jump straight up, and switch the position of your legs midair, bringing your left leg forward into a lunge position as you land on the balls of your feet. Keep jumping and switching legs until your time is up. Burn Booty BURN: Glute Workout !